Spoiler alert: Sitting for hours on an airplane will make you feel like sh*t. OK, no spoilers there. That's obvious. But there are a couple simple tricks that can help with both circulation and the inevitable soreness you'll feel after a long flight. 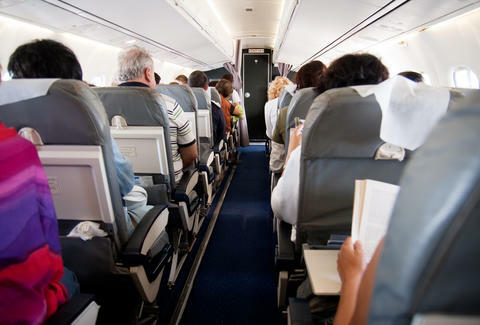 Cardiology fellow at Boston's Brigham and Women’s Hospital Dr. Aaron Aday recently revealed to Conde Nast some good tips for alleviating circulation problems when flying. His tips, coupled with some notable pre-boarding stretches, should help you survive that flight to Paris and come out ready to take on that walking tour, or at least in better shape for that walking tour. First, Dr. Aday says you should get up once every hour when in the air, which means it would be helpful to book the aisle seat. While seated, Aday suggests doing little stretches like flexing and relaxing your calf muscles, rolling ankles, and clenching and spreading toes. This will all help to get the blood flowing. There are also a ton of pre-boarding stretches you can do to prevent soreness after a flight. For instance, Men's Health recommends doing a stretch that affects your hip flexors and quads at the gate. Also, Women's Health outlines a few stretches to be done pre-boarding, suggesting a standing calf stretch and a kneeling hip flex among others. Finally, these airport yoga poses will keep you calm and loose. All of this will totally be worth any embarrassment you'll feel stretching in public. Just ignore the stares and think of all the future cramps you're preventing. Kara King is a News Writer at Thrillist and gets embarrassed easily. Send news tips to news@thrillist.com and follow her at @karatillie.